Just Visiting Too the new ep from ZO! is a must have for not only the connoisseur of classic R&B but for lover’s of great music and musicianship. The 7 track ep features covers of tracks by Minnie Ripperton, The Jones Girls, Prince, Don Blackman, Bobby Caldwell, Quincy Jones and The Isley Brothers. Did I mention that it is available now as a free download? I’m not telling you what to get someone as a gift for the upcoming holiday season…but you should certainly put them on to this great collection of classic songs. ZO! has compiled a stellar supporting cast comprised of Carlitta Durand, Darien Brockington, Phonte, Sy Smith, and Yahzarah. Each vocal feature has been cast with very careful consideration because each track sounds and feels tailor made for the artist. ZO! serves as the entire rhythm section [on 6 out of the 7 tracks] he is accompanied by Omar Hunter El on acoustic and electric guitars on The Isley Brothers cover of Highways Of My Life Pt. I & II. 1. 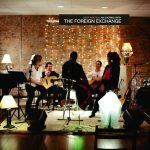 This is yet another outstanding musical offering from The Foreign Exchange family (notice a trend???). 2.This is the good kind (in regards to the great Louis Armstrong’s summation of music). 3. This wonderful project is offered as free download…I’m going to pause right here for a moment and let that marinate. If you love the good kind like I do then here’s an opportunity for you: Let all your friends, family and colleagues who love the good kind (and even those who don’t) know about ZO! – Just Visiting Too you can even send them the link…my treat. Special Rating: Download…now!